But for me personally, one of the most satisfying events so far this year has been the re-emergence, after a well deserved rest, of John Martyn. I have never disguised my respect and love of Martyn’s music in the past, and nothing gas happened since I wrote that lengthy article on him in Zigzag 41 to make me change my mind. In fact, the two albums he’s released in the intervening period, Sunday’s Child and the live album recorded at Leeds University, have if anything fortified my belief in the man’s vision and ability. Sunday’s Child (reviewed in ZZ50) is simply one of the best British albums to be made in the 1970s… it just seems to get better all the time, and with the absence of any new material from him in the last two years I’ve played it incessantly and without the slightest fears that I’d ever grow tired of it. It was released way back in February 1975 and indeed he spent most of that year promoting, playing an enormous number of gigs along the length and breadth of the country until in the end he flaked out, physically and mentally exhausted to the extent that he spent most of 1976 recuperating, away from the public eye. So when the Island press office rang up the other week and said that John was around and would I like to speak to him, my immediate reply was “Yeah, sure…I’d love to”, but when the time came for us to sit down and switch the tape recorder on, I realised that there was in fact very little for us to actually talk about. Since the last time I spoke to him, which was at the Avignon Festival in France in 1975, his musical activities has been somewhat limited, and it was obviously pointless to go back over ground already covered. There are, however, one or two points to be made about the man and his music which will conceivably throw some light on the possible content of his forthcoming album and the structure of his next tour which is tentatively scheduled for the autumn. (By the time you read his he will have just completed a 14 date British tour… hope you had the good sense to go and see him). Undeterred, therefore, I began our mini-interview by asking him what he’d been doing (if anything) during the last year. “I went on holiday to Jamaica, played a few sessions over there, came back, played a couple of gigs over here, the July Wakes Festival and an open-air gig in Regent’s Park. I took it easy a lot of the time, though… all that gigging in 1975 really did me in. I feel wonderful now though, in top form. I’ve just about got a new album ready, I start recording it in March and some of the material on it is a bit more angry now. I’m a bit pissed off by a couple of things that have been going on, and I’ve stuck a few nasty edged things in there. But I mean, it’s about time I did that anyway, I think. I was getting a bit cheesed off with the ‘Prince Charming’ image, for want of a better phrase. It was becoming a little bit fey at the edges, people were beginning to think I was a little bit too nice, and it was confusing”. Before this new album hits the market, though, Island are releasing (or have already released) a compilation album entitled So Far So Good, which besides hopefully bringing most of his best work together on one piece of vinyl, also commemorates the completion of his first decade as a professional musician. 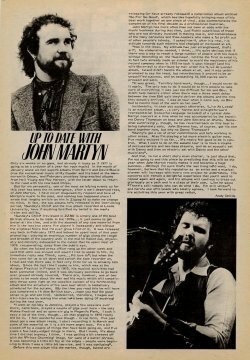 John Martyn has more often than not been at odds with the music business during that time, justifiably suspicious of those who are not directly involved in making music, and contemptuous of the many parasites and free-loaders who make a fat profit out of other people’s talents. I asked him if, after his rest, his attitude towards such matters had changed or mellowed at all. “Not in the least. My attitude has just strengthened, that’s all”. No elaboration needed, I think… it’s quite obvious that if there was a way to reach a large number of people with his music without depending on the ‘business’, he’d be the first to extol it. In fact he’s already made an attempt to avoid the machinery of his record company when in 1975 he took it upon himself (and his wife Beverley) to distribute by mail order his Live At Leeds album. Island didn’t handle the album at all, and it was underpromoted to say the least, but nevertheless it proved to be an unqualified success, and an astounding 10,000 copies were pressed and sold. “It was great. Terribly hard work, though… I would never do it again. The only way to do it would be to hire people to take care of everything; it was just too difficult for me and Bev. It didn’t help matters either when there was a three week delay between the time EMI said they’d deliver the albums and the time they actually arrived. I was on tour when it came out, so Bev had to handle most of the work on her own”. Incidentally, in case you suspect otherwise, Live At Leeds is an excellent album… a very honest and straightforward representation (colourful language included) of a typical John Martyn concert at a time when he was accompanied by the excellent Danny Thompson on bass and John Stevens on drums. Somewhat surprisingly, though, he has reverted back his tour to being completely solo. John Stevens has, of course, got his own band together now, but why no Danny Thompson? “Danny’s got a lot of other commitments and he’s working in other areas. Also I’m playing a lot more electric guitar now. I’ve really enjoyed it so far… it’s really felt good to be in control. What I want to do on the autumn tour is to have a couple of percussionists and two bass players, and do an acoustic set with Danny and then an electric set with Danny and the other musicians”. And that, to cut a short story even shorter, is just about that. I’m not going to end this piece by predicting that this will be the year when John Martyn really makes it and becomes a huge success… Blimey! I’m sure that’s the last thing he’d want. I do, however, believe that his reputation as an artist and a musical pioneer will increase with every new project he undertakes. His concerts will remain a delightful experience that you’ll want to repeat again and again, and his new albums will continue to blaze out gloriously on a path and in a class of their own. Like he says: “There’s still nobody who can do what I can do. I’m still unique”, and here’s one aficionado who totally agrees. I look forward to his activities this year with great relish.